Example Summary thanks to Lubos Motl (posts on PhysicsOverflow) who also contributed the example review. The new paper starts with some comments you have seen on TRF many times: EPR-style entanglement doesn't represent any genuine non-locality. It doesn't allow you to send any genuine information to spacelike-separated regions of the spacetime i.e. faster than light. Correlation isn't causation; quantum mechanics predicts correlation for EPR-style experiments but the correlation/entanglement is a consequence of the objects' mutual contact in the past when the state of the whole system was prepared, not a consequence of any action at a distance in the moment of the measurement. There is another concept that doesn't allow you to send the information superluminally although you could naively think that it can: the Einstein-Rosen bridge. This is a technical name for a special wormhole, one that is constructed by gluing and/or maximally extending the vacuum solutions of Einstein's equations of general relativity i.e. things similar to Schwarzschild's solution for an empty and neutral black hole. 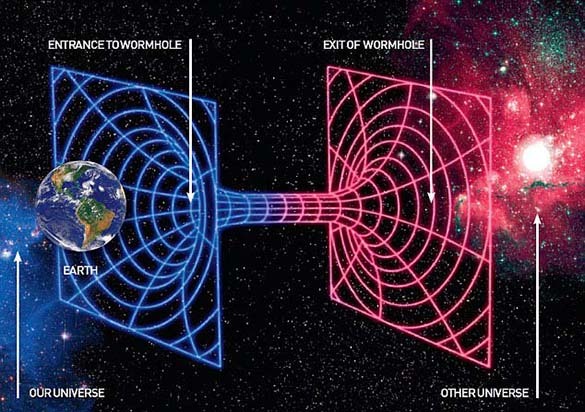 A reason why this sort of a "non-traversable" wormhole doesn't allow any standard faster-than-light communication (at least not a permanent one) is simply the black-hole-like appearance of the exterior of the wormhole (on both sides): you may only catch the would-be information that has propagated through the wormhole if you actually jump into the black hole but in that case, you de facto commit suicide and give up the right to exchange the information forever. Once you jump to the black hole, you may say that your position with respect to the exterior asymptotic region of the spacetime is "confusing". You are somewhere in between the original two widely separated places, not in the vicinity of either of them, so your perceptions shouldn't affect the question whether the two separated places may exchange the information. They cannot and you don't belong to those places anymore! So both ER and EPR are concepts that could naively allow you to send the information faster than light; but both of them actually refuse to do so. They share these two properties so they could be the same thing. Of course, it's not a proof that they're the same thing which is why Maldacena's and Susskind's claim that they are actually the same thing both non-obvious and non-vacuous contribution to physics if it is true. And they have some more detailed evidence that it actually is true. Whenever there are two objects that are entangled, one may view this entanglement as the existence of a wormhole of some kind. However, in most cases, such a wormhole is Planckian, so to say, and it requires the full theory of quantum gravity – going well beyond the effective long-distance theory similar to general relativity – to be properly studied. (I can't resist to think about the thin handles that may be added to M2-branes modeled by Matrix theory without changing the state described by the noncommutative geometry; their spacetime wormholes must be analogous to these "world volume wormholes".) They admit so: they reinterpretation of the entanglement as an Einstein-Rosen wormhole may often be just an academic formality that doesn't allow you to exploit the useful properties we like to associate with large and thick wormholes. On the other hand, they accumulate quite some evidence that a greater number of examples of entanglement than what you might think may be described in terms of the Einstein-Rosen wormhole that is really large and classical and unquestionably deserves the title. In particular, they suggest that once a black hole evaporates one-half of the original entropy, i.e. after the Page time when we know the early radiation to be almost maximally entangled with the remaining black hole, one automatically gets the "thermofield-like" doubling of the degrees of freedom – doubling of the number of black holes. The early Hawking radiation may be interpreted as one of the two black holes that is connected (after some transformation of its degrees of freedom) to the remaining, self-evident black hole by the Einstein-Rosen bridge. The authors claim that this has consequences for the perceptions felt by an observer who jumps into the remaining black hole: his perceptions – which may include the firewall-like death near the horizon – are actually affected by the decision what some other observers do with the early Hawking radiation! After all, manipulating with the early Hawking radiation should be interpreted as processes "somewhere inside the wormhole" so these processes may be thought of as appearing "geometrically close to the black hole interior" because this is where the second exit from the wormhole resides! Whether or not such an influence of the "experimenter measuring the early Hawking radiation" on the "infalling observer" violates any notion of locality and how strongly is a subtle question that requires you to be careful. Clearly, some locality as defined strictly by classical general relativity (and assuming the non-wormhole relationships between events in spacetime!) has to be violated because the measurements of the early Hawking radiation can't be connected by any time-like trajectory with the events in the remaining black hole interior. However, they are connected in more general ways. Even if the infalling observer is able to miraculously find out something about the activities done by very distant, seemingly spacelike-separated experimenters who measure the early Hawking radiation, it doesn't imply any real paradox that we may derive from faster-than-light communication simply because the infalling observer has no way of communicating his perceptions to the folks outside the nearby event horizon. We shouldn't overstate the reasons why we believe principles such as locality. We believe them because in combination with the Lorentz invariance, faster-than-light communication would be equivalent to the changes of the past and closed time-like curves that would lead to contradictions. However, if we consider more general situations with "doomed infalling observers" whose doomed fate allows us to avoid the paradoxes, the original evidence in favor of the strict locality really evaporates. The observer on one side of the Einstein-Rosen bridge may control the perceptions of the other if she acts quickly enough; a section of the paper is dedicated to the question what this condition means. It seems that they want to apply these considerations to the experimenter who manipulates with the early Hawking radiation, too. She has some power over the poor observer who falls into the remaining black hole after the Page time. "Even if the infalling observer is able to miraculously find out something about the activities done by very distant, seemingly spacelike-separated experimenters who measure the early Hawking radiation, it doesn't imply any real paradox that we may derive from faster-than-light communication simply because the infalling observer has no way of communicating his perceptions to the folks outside the nearby event horizon." Thanks to Lubos Motl (posts on PhysicsOverflow) for allowing to us to use his blog post as an example review. Cool horizons for entangled black holes. Update: See also John Preskill's enthusiastic review of the paper. Healfix finds the paper controversial, either wrong or the first salvo of a completely new revolution. I don't. The paper is cool but it's a totally natural continuation of the state of the affairs as we have known it for quite some time. It builds on Werner Israel's thermofields (Werner Israel is an ex-collaborator of our Gordon Wilson), Maldacena's 2001 comments about the "pair of CFTs" description of the eternal AdS black hole, and some ideas about "entanglement as a topology change" that I recently associated with Mark Van Raamsdonk although many people, including your humble correspondent, have been thinking about the same paradigm for many years. Ryu and Takayanagi have contributed an influential 2006 paper about the entanglement in the black hole context. The ideas linked to thermofields and the doubling of degrees of freedom were recently mentioned and exploited by the Raju-Papadodimas paper but again, it's true that a dozen of credible researchers or so has thought about these matters in this way. I need to mention that Juan Maldacena's image among those who have a clue about theoretical physics is so stellar partly because he has never written a paper – and perhaps a sentence in a paper – that wouldn't be supported by rock-solid evidence. (Well, Horowitz-Maldacena's intriguing yet speculative "black hole final state" may be an exception to the rule but the logic of that paper may get revived due to this Maldacena+Susskind development, too.) And this paper is no different. Comments by folks like Sean Carroll that these authors may afford to write rubbish because they have tenure has nothing to do with the actual reality. These is completely false and sort of disrespectful. These folks have way too much to lose – their top status in theoretical physics, acquired by having written systematically valid and important contributions to physics. Carroll has never cared about the validity or quality of his papers and claims which is why he's respected as a physicist by the know-nothing popular bullshitters only but Maldacena (in particular) is a genuine scientist, the ultimate cautious researcher who is, despite these tough constraints, still able to ignite revolutions at some points and it's no coincidence that he was among the inaugural recipients of the $3 million Milner Prize. A nice thing about the paper is that it passes all tests of "absence of basic misunderstandings". The authors don't seem to suffer from any confusion such as a misunderstanding of the foundations of quantum mechanics. I have already suggested that this virtue results from Juan Maldacena's genes incorporated into the paper. (Lenny, despite his being so utterly sensible, has already written some papers boiling down to a misinterpretation of the postulates of quantum mechanics.) In fact, I believe that Juan Maldacena is flawless in this respect – he would never write a paper that makes an error in the foundations or interpretation of quantum mechanics or any other topic that one could include among the "standard undergraduate or graduate course material". I believe he suffers from no confusions that are so widespread in the "popular science literature". To say something stronger, much of the paper seems obviously right. Quantum mechanics is used fully up to the limits and they struggle to interpret any dynamics – including any sort of entanglement – geometrically, as a bridge of a sort. That's right because after all, string theory unifies all forces and matter with gravity so everything may be viewed as a generalized gravity or generalized geometry. At the same moment, there's quite some potential for this line of reasoning to run much deeper than that. Various folks including Edward Witten and Cumrun Vafa have explicitly said that while they didn't expect any true deformation to be ever made to quantum mechanics, they could imagine a future revolution that will unify the postulates of quantum mechanics with all kinds of geometry that appears in physics (especially the spacetime geometry) in a new, more intimate way. The geometrization (conversion to a bridge) of any entanglement in physics could lead us to a very tangible realizations of those ambitious visions.